Supporters of Taiwanese activist Lee Ming-che detained in China, chant their support during a media event in Taipei, Taiwan, Nov. 28, 2017. A Chinese court's conviction of a Taiwanese activist, on charges that his social media posts incited subversion of state power, will spawn fresh suspicion in his homeland toward an already distrusted Beijing government, observers say. The five-year sentence handed Tuesday to Lee Ming-che for pushing for democracy through a Chinese social media group will make other Taiwanese wonder about their fate if they live under Beijing’s rule someday, academics and fellow activists say. 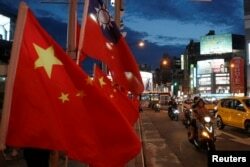 Communist China claims sovereignty over self-ruled Taiwan and insists on eventual unification. Taiwanese have grown used to free speech, including advocacy of different political systems, without getting into legal trouble since their own government democratized in the late 1980s after decades of authoritarian rule. “We think this is a so-called verdict that Taiwanese can’t accept,” Taipei-based Judicial Reform Foundation lawyer Kao Jung-chih told a news conference in Taipei after China’s official Xinhua News Agency announced the sentence from a courthouse in Hunan province. Lee had posted to the Internet in Taipei, Kao said, but got charged later in China. Other Taiwanese post freely, he added, and then travel to the other side. China hopes Lee’s sentence will send a message that Taiwanese should avoid discussing political issues with mainland Chinese people, even from home, activists and scholars in Taipei believe. Pro-democracy protesters carry a photo of detained Taiwanese rights activist Lee Ming-Che (L) and other activists during a demonstration in Hong Kong, China, Sept. 11, 2017. The message may deter people from unnecessary travel, said George Hou, a communications lecturer at I-Shou University in Taiwan. From one to three million Taiwanese live in China long term, often as investors and their relatives. China now encourages younger Taiwanese to come as interns or employees of startups, a chance to earn money in an $11.2 trillion-plus economy that is growing at nearly 7 percent. About 3,000 individuals and workplaces in Taiwan are displaying yellow ribbons to advocate for Lee’s release. In 2012 Lee joined a China-Taiwan social media group formed by Chinese national Peng Yuhua, who received a seven-year sentence Tuesday, the official Xinhua News Agency reported. 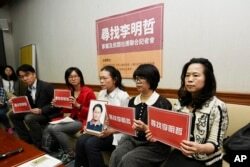 The group aimed to “overthrow” the current form of Chinese government, Xinhua said. Lee had faced up to 10 years in prison. He had worked in Taipei as a university program manager while helping do research for local human rights organizations. Xinhua did not link the case to other aspects of China-Taiwan relations. Taiwanese following the Lee trial, including bits that were released on video, wonder whether Lee confessed to charges under pressure and why he didn’t have more help from a lawyer. 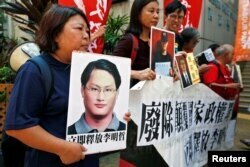 His disappearance from the Chinese territory of Macau in March before being charged in mainland China raised further suspicion. Lee’s case came on the back of perceived economic and military pressure from China, prompting questions about whether it was related. Since Taiwan President Tsai Ing-wen took office in May 2016, China has sent an aircraft carrier around the island, scaled back tourist arrivals and persuaded two countries to switch recognition from Taipei to Beijing, Taiwan officials say. China and Taiwan have been separately ruled since Chiang Kai-shek's Nationalists rebased in Taiwan after losing the Chinese civil war. Officials in Beijing see formal dialogue as a conduit to unification and resent Tsai for rejecting their dialogue condition that both sides belong to one country, China. The two sides talked briskly from 2008 to 2015. FILE - Flags of China and Taiwan flutter next to each other during a rally calling for peaceful reunification, days before the inauguration ceremony of President Tsai Ing-wen, in Taipei, Taiwan, May 14, 2016. The London-based advocacy group Amnesty International linked Lee’s case to more than 240 other political activists who have faced pressure in China since 2015. Lee’s prison term is a one-off for Taiwanese, but others occasionally get detained, including a Taiwanese practitioner of the banned spiritual group Falun Gong in 2015. Despite condemnations from the government and Taiwan’s ruling Democratic Progressive Party, some activists want more official follow-up to the Lee verdict.